Save Buffalo Bayou is a 501c3 nonprofit association. Donations to Save Buffalo Bayou are tax deductible. The trustees are Blaine Adams, Susan Chadwick, William Heins, Tom Helm, Olive Hershey, Richard P. Keeton, and Frank C. Smith Jr.
Frank C. Smith Jr, a retired electrical engineer, is the founding president of the board of Save Buffalo Bayou, now president emeritus. He is a founding member, board member, and past president of the Bayou Preservation Association and served on its executive committee for nearly fifty years. He is a founder of the Galveston Bay Foundation and serves on its advisory council. He is also a founder and past president of the Armand Bayou Nature Center, a lifetime board member of the Memorial Park Conservancy, past president of the Texas Nature Conservancy, and past president of the Rice Design Alliance, among other activities. He has lived on Buffalo Bayou throughout his adult life. Blaine Adams, treasurer of the Save Buffalo Bayou board, is an investment manager in Houston and trustee with Prometheus Charitable Trust. She has served on the board of the Memorial Park Conservancy and lives on Buffalo Bayou. Susan Chadwick, a writer and journalist who grew up on Buffalo Bayou, is the president and executive director of Save Buffalo Bayou. She was the art critic for the Houston Post from 1985 until it closed in 1995. William Heins is a senior research geologist working in Houston. He received his doctorate in geology at UCLA in 1992 and was a Fulbright Scholar at Eötvös Loránd Scientific University in Budapest. He has undergraduate degrees in both geology and economics from the University of Pennsylvania and speaks English, German, Hungarian, and Mandarin Chinese. Tom Helm is a geologist, geoscience consultant, naturalist, and river guide. He lives on White Oak Bayou. Olive Hershey, secretary of the board, is a poet, novelist, and environmentalist and a member of the Texas Institute of Letters, of the advisory board of Inprint, and of the board of the Jacob and Terese Hershey Foundation. She was a board member and officer of the Sierra Blanca Legal Defense Fund and a board member of Friends of Hermann Park. Board member Richard P. Keeton is a prominent Houston trial lawyer currently of counsel to the international law firm McGuireWoods. He is a graduate of the University of Texas and the UT Law School and has been included in The Best Lawyers in America since 1983. Janice Walden, writer, outdoor educator who grew up on Buffalo Bayou, co-founder of the Don Greene Nature Park, paddling program leader and Eagle Scout advisor for Boy Scout Troop 55. I am sitting on the beach at the Middle Meander, watching the afternoon solstice sun on the bluff. Crows and red tail hawks are skirmishing, an egret waits paitiently for a fish, an alligator gar grabs something and leaves an improbable wake. The City of Houston is far away from my spirit, even if my body is sitting right in the middle of it. It does my soul good to sit here and watch the bayou slide by. It also makes me sad that this would be the biggest cut and fill of the so-called Memorial Park Demonstration Project. An area with an Astrodomal footprint would be clearcut, the lazy hairpin that has been wiggling around for millennia would be bulldozed into a precise sine wave, and the astonishing topographic exclamation of the bluff would be laid back and buried under a flaccid shroud of Caterpillar poop. I am confident that the bayou would put everything back in its proper place eventually, but it would be ugly in the meantime. This is why I stand with Save Buffalo Bayou against all wrongheaded efforts to bludgeon the bayou into unnatural submission. Thank you, Bill Heins, for this poetic observation. You are an essential part of the Buffalo Bayou defense team. Thanks Bill for your very beautiful and insightful comments and observations. Wish everyone could get over to that area and experience the majesty before the misguided ones in charge destroy it during our lifetimes ! Ms. Chadwick, I have been wanting to contact you regarding your comments on the Michael Bloom articles on Boom Town Flood Town.I have been saying to myself and anyone that will listen the almost same points that you have been making on flooding. I have not been able to find an email address for you to request getting on the distribution list of your flooding articles and comments. 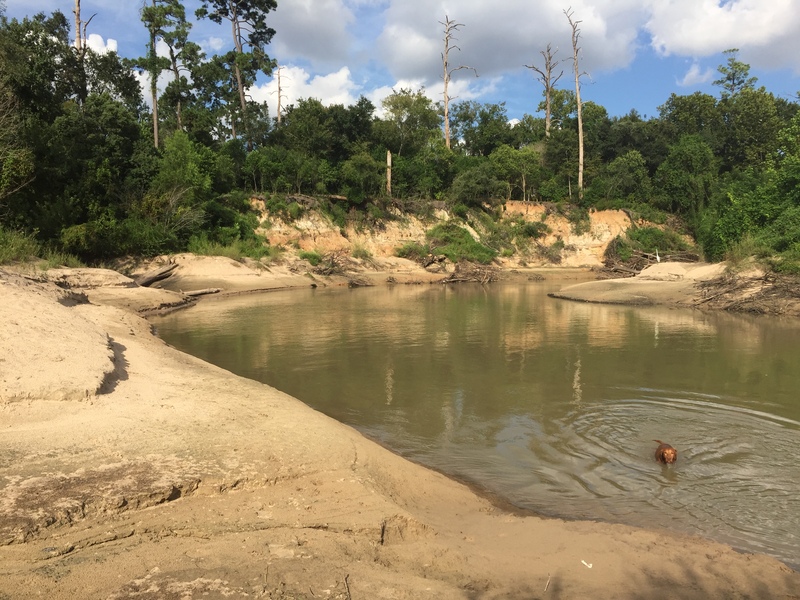 I’m in the Cypress Creek watershed, was recently elected to the BOD of the Cypress Creek Flood Control Coalition, and do volunteer work as I can to try and educate the public. I am a retired Engineer and an old dude so I don’t get around that much and frequently miss some of the good articles you publish. Congratulations on being an out of the box thinker and someone whose opinion I have a lot of respect for. Great to have you, Dave Baldwin! Thank you. There is a spot on our website down on the right side for you to enter your email address so that you can get updates. But I will now do that for you. p.s. Be sure to check your spam folder if you think you are not receiving our notices. I would like to join your struggle to save our beautiful bayou. My son lives in a town home on the bayou on Crestwood Drive. Every night you can see hundreds of little rabbits and foxes– what will happen to the innocent wildlife if this area is destroyed not to mention the bluffs, trees and plants. If feel a big problem is most people have not seen this area so they may not realize its importance and beauty. Why not take a video tour in the early morning, mid day and evening to show its beauty. And also show the wildlife at night. You need publicity to make our citizens aware before it is too late! I live near Braes Bayou–there are fish and birds but no other wildlife! Please call me at xxxxxxx. When is the next meeting? Have you thought to have a petition or even a law suit to stop the destruction. This could be deemed a protected national park or preserve. Have you reached out to other environmental organizations to help save this area? Yes, we will have a general meeting soon. In the meantime it is very important that you contact Precinct 4 County Commissioner Jack Cagle. He’s in charge of this area. Also call or write Mayor Sylvester Turner and your city council representative and tell them you don’t want any more tax money spent on this project to destroy a precious public asset. Tell all your neighbors and friends and download a flyer from our website under What To Do Now. We are hoping we won’t have to go to court, but we are preparing to do that if necessary. So please consider donating. We need your financial help. There’s a Donate button on the side of the page. You guys should really take a class on ecology and learn about healthy ecosystems because while you all are obviously very passionate, you are simply ill-informed. It is groups like this that prohibit successful ecological restoration of a collapsing ecosystem that is in desperate need of saving. Taking a couple of pictures of site conditions that look attractive but are actually failing ecologically is unbelievably irresponsible, naive and ignorant behavior. Please research. Act like scientists rather than spouting emotionally charged inaccurate and misguided beliefs about the ecosystem you are so fighting for. Get on the right side of the Buffalo Bayou’s sustainability fight. Don’t fake pretty pictures and act like that is worth saving when it does next to nothing for the ecosystems carrying capacity. Be responsible stewards if your going to do anything. you guys have good hearts, put them to better use so the ecosystem is restored not a stand of over mature trees are saved until they die with no recruitment to carry on that pretty picture that instead immediately is overrun with shrubby invasive pioneering spp that erodes your tiny nook you fought so desperately to save but ultimately sealed its fate to be destroyed. This website is filled with scientific information that will help you understand how rivers work, why this “Natural Channel Design” project will fail as so many others have failed before, the ecological damage that it will cause, the contradictory, baseless, and erroneous claims made for the project by its promoters, why this heavy-handed channelization approach is outdated and discredited, a waste of public funds, and will cause more flooding and erosion within the channel and downstream. And more. You might start by learning about how even urban streams can heal themselves and why dynamic rivers that have room to move, as this one does, are healthier and more biologically diverse, which is why the rest of the world has moved on to the enlightened concept of a river corridor. We offer you plenty of links to scientific documents, some of them written by our own advisor, Matthias Kondolf of the University of California at Berkeley. Prof. Kondolf is one of five scientists on our advisory board. Try looking under The Plain Facts and The Top Eleven Phony Arguments for Bulldozing Our Wild Bayou and the Right Answers. This public, forested stretch of the river is a priceless and irreplaceable natural asset in the middle of the city, a historic nature area that should be preserved for future generations. Clearly their are ways to interpret and misinterpret scientific research and one project study’s applicability to another. It doesn’t matter but I will qualify my position by explaining that I am a ecologist, was the conservation director for 8 years working to restore ecosystem function to Houston and Harris County bayous, own an ecoogical restoration and natural resource management company that works on all of our ecoregions declining ecosystems and wildlife habitats with a particular passion for restoring the functional mechanisms responsible for riparia carrying capacities dependent on the diversity and sustainability of the ecotones dependent on the watercourses lateral influence on plant community interactions. while logic suggests scientific findings are in deed facts, the human factor more often than not, inserts an enormous range of flaws and “wink links” that are often used as opportunities for interpretation. where we see those opportunities to reinterpret findings to justify our ethical and moral belief system (often heard when they are contrary to the findings) right or wrong is no longer a logical factor because the outcome is so relative and so far apart in each sides spatial and temporal goals. I look at the degraded system through a lense that reveals the damage, decay, lost functionality, lost carrying capacity and thus lost value that is not and cannot move along a trajectory that increases sustainability. From what I’ve read about your argument and your comments and you value what you see by interpreting an acute snapshot of space and time. It satiates our visual desires of what a natural system can and should be whether its in decline or improving ecologically is reduced to a non factor. If you look at a ferrari in all of its visual perfection to many, does that mean that the water the owner put in the gas tank hasn’t destroyed the actual value of the car even though the exterior remains flawless. Can a fashion model who by all accounts looks and is viewed as having ideal human features yet have cancer corrupting her bodies ability to function in the future despite her intact beauty that in a snapshot of her life her appearance was in direct opposition of her temporal reality. My point being is that your side and my side are standing at two different points in space and time and our lense we are looking through is relative to our different positions. Those positions are based on our interpretation of the science which is based on our ethical and moral belief systems that provide us with our value as a human being. THose ethics and morals are really only based on our life experiences interpreted through our psychology formed in infancy primarily by our family of origin. So if we agree to disagree and use a basic and good human trait of acceptance and understanding then there is the potential that regardless of what ultimately happens a win win results. Look, I have sat on now 3 flood control committees with some of the brightest and passionate lovers of nature who truly in their hearts and souls believe that the rigorous, extensive and consuming studies and analysis and years of work by dozens of experts have resulted in only one way to restore the bayou ecosystem and they are pursuing that way with every bit of passion and belief that your group is expending to oppose it. I was looking through reference research publications for another project I am working on when I came across the work below that helped me start to accept your point of view despite every cell in my body screaming at me to argue the ignorance of your position. Our value derived through our visual experience of nature is influenced by contextual images of our beliefs that we use to identify ourselfves as good and responsible and on the right side of humanity and goodness and care and respect. Let’s stop stroking that little ego that isn’t really the true nature of humanity. Yeah I got all that from the work below… mostly. the rest from experiences that created my belief system so i feel good and life affirming and protector of the earth and all its creatures. IS THERE A CORRECT AESTHETIC APPRECIATION OF NATURE? Description Saito challenges the philosophical arguments used to support the view that scientific knowledge of the nature is an essential part of an appropriate aesthetic appreciation. Methodology This paper uses philosophical argument to take issue with the concept of an appropriate appreciation of nature adopted by Carlson (1981). Carlson claims that there is a similarity between the aesthetic appreciation of art and nature. “According to him, just as some appreciations of art are aesthetically more appropriate than others, so there are more or less aesthetically proper interpretations of natural objects” (p. 37). However she does accept that aesthetic judgement is influenced by prior nonaesthetic judgement concerning the value of nature. She suggests that aesthetic arguments can be used to support the ecological cause. Keywords environmental aesthetics; aesthetic appreciation of nature; environmental ethics. In this case we are not looking at a beautiful exterior that has an internal corruption that must be fixed (like the car or the model), we are looking at an exterior that some view as flawed (“eroded”, “not at carrying capacity”) and therefore in need of repair. I look at that exterior and see a natural system doing exactly what it is supposed to do, which will do its job much better if we get out of the way. The bayou flowing past Memorial Park is working just fine, thank you. We can make a moral and aesthetic judgement about that based on the scientific evidence. We do not have good scientific evidence that there is any problem, or at least any problem that the MPDP would fix. Forest saved … homes destroyed. Apparently your home was flooded, or you believe you are speaking for homeowners on Buffalo Bayou whose homes have been flooded. Our profound condolences for all those who have lost their homes and belongings everywhere in Houston. But homes did not flood because trees were saved. Not that trees have been saved. The Harris County Flood Control District has been cutting down trees on Buffalo Bayou and on streams all over the county. Our advocacy on behalf of forest on the river is not sentimental. It’s a scientific fact that trees and vegetation help prevent flooding. They disperse and absorb rain water and slow runoff. They hold the soil in place. They also are necessary for cleansing the water. Among many other things. Flooding on Buffalo Bayou was caused by the rapid runoff of stormwater from paved and built surfaces into our drainage systems and into our streams, both above the dams and along Buffalo Bayou. Not that anything could have prevented the massive and rapid inundation of our city from this extraordinary storm. But we need to come up with ways to slow, spread out, and absorb stormwater so that we can stop it from running into our bayous and streams all at once. This is called lag time – the lag time between peak rain fall and peak flow in a stream. Trees and vegetation do that. More permeable surfaces do that. Most experts in the field recognized long ago that stripping and straightening streams to flush stormwater more quickly only causes more problems downstream – flooding and eroding someone else’s property, as well as in the stripped and straightened stretch. Blaming the forest is wrong. We advocate for more effective and more cost-efficient solutions in keeping with the most advanced thinking on flood risk management around the world. And these solutions work with nature and natural processes, learning from nature. We cannot fight nature. We won’t win. We all lose.